The FBI interviewed nine people for its investigation into allegations of sexual misconduct against Brett Kavanaugh, the Supreme Court nominee, The New York Times reported. An official briefed on the review told The Times that the FBI did not closely examine Kavanaugh’s drinking habits. Former classmates of Kavanaugh’s have accused him of lying under oath about how much he used to drink. Critics have said the investigation, which took less than a week, was too narrow in scope. Senators are set to read the report Thursday – in shifts and under intense security. The FBI interviewed nine people about the allegations of sexual misconduct against Brett Kavanaugh, the Supreme Court nominee,The New York Times reported on Wednesday, citing an official briefed on the investigation. 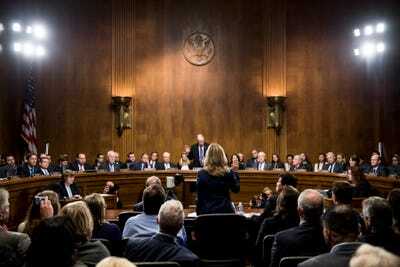 The official added that the FBI did not closely examine Kavanaugh’s drinking habits, an issue that became a prominent part of his hearing before the Senate Judiciary Committee last Thursday about Christine Blasey Ford’s allegation that he sexually assaulted her at a high-school party in the 1980s. Deborah Ramirez, who has accused Kavanaugh of exposing himself to her at a party when they were at Yale University. Mark Judge, a friend of Kavanaugh’s who Ford says was in the room when she was assaulted. Leland Keyser, a high-school friend of Ford’s who she says was at the party where Ford says Kavanaugh assaulted her. PJ Smyth, another classmate of Ford and Kavanaugh’s who Ford says was at the party. Five other people who were not named. The Times said the nine people interviewed did not include Kavanaugh or Ford. The official told the newspaper that the FBI contacted a 10th person but did not interview them. Democrats, classmates of Kavanaugh’s, and another woman accusing Kavanaugh of sexual misconduct have criticised the investigation as being too limited in scope. The former classmates have accused him of lying under oath about his drinking habits, saying he would often drink heavily, and called for his claims to be examined. But The Times reported that the FBI focused on Ford and Ramirez’s allegations and did not closely examine Kavanaugh’s broader lifestyle as a young person. James Roche, Kavanaugh’s former roommate at Yale, pushed back on Kavanaugh’s statements under oath that he never blacked out despite sometimes drinking too much beer. Tom Williams-Pool/Getty ImagesChristine Blasey Ford has accused Kavanaugh of sexually assaulting her when they were in school. He has denied the allegation. After complaints that the scope of the investigation was too limited, President Donald Trump authorised the FBI to interview anyone it deemed necessary. The FBI has not publicly said why it only decided to interview five more people. All 100 US senators can read the FBI’s report, which is classified, on Thursday – from a single copy, in one-hour shifts, under intense security. The Senate is due to vote on Kavanaugh’s confirmation on Friday.